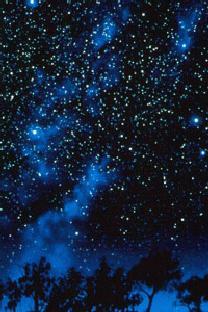 Night sky from a dark site, as it would be seen by the naked eye. To look at the night sky in remote parts of the world is to be stunned by the clarity and brightness of the myriads of stars and other objects that are there to be seen. It is an experience that people such as Aristotle, Galileo and Newton were fortunate enough to see throughout their lives. And the beauty and fascination of clear, dark night skies has inspired countless people to take an interest in science and mathematics and helped to bring about the technological age which we all enjoy. Nowadays, this magical heritage is being fast-eroded to the point where, in towns even, such as Stratford and Warwick, light pollution reduces the numbers of stars that can be seen to dozens. Far from being an inspiration, urban night skies are merely that bright orange glow that is there after dark. In rural Warwickshire the situation is much better but is threatened by spillage from local towns, Coventry, Solihull and Birmingham. An article on Observing Under Light Polluted Skies can be seen in the Guide to Observing section. 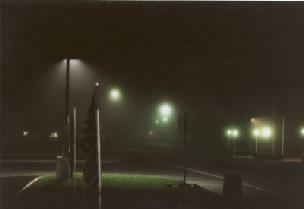 Light pollution is not just an issue for scientists and astronomers. It should be a matter of concern for politicians and local authorities and the millions of people who suffer as a result of lighting which is too bright and obtrusive. 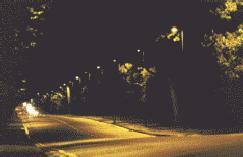 Light pollution can cause harm to the urban and rural ecology on which birds and other wildlife depend. Obsolete fitting with "bowl" – serious light spillage. Excellent fitting with "total cut off" housing – no spillage. By selecting properly designed lighting, by directing it to where it is needed and installing automatic switching to turn it off when not required, people can enhance the environment and save energy and scarce resources. There are organisations that are working towards persuading Government and other bodies, and individuals, to take a more responsible and responsive attitude to the matter of "dark skies" and some of the leading ones are listed at the foot of this feature. Spot the modern, efficient, street lamp. Taking the example of street fitting, most of the street fittings used in the UK have a traditional fitting which wastes a high proportion of energy on the sky and elsewhere. The prime cause of the problem is that the lighting element is too low and is associated with a glass "luminaire" or bowl which refracts the light on to, and away from, the road. The above photographs compare an obsolete "bowl" type fitting with a "total cut off" design which is physically designed so that no light goes into the sky – no wastage, no glare, less energy. What can Organisations and Authorities do? Here is just one example of the dramatic improvement possible on urban streets when an enlightened approach is taken to lighting. Companies, authorities, and other bodies such as universities and sports clubs can take the lead from leading organisations that are making "total cut off" lighting mandatory for many applications. The worst offenders are probably the spherical "globe" units but wall lights, such as these, are very bad, too. What can individual householders do? With the increasing use of exterior lighting in gardens for courtesy and security purposes, Britain's 20m plus householders need to be sensitive to the need to reduce "light nuisance" and energy costs. "Total cut off" principles can be used, together with light sensing switches. Consider the fact that burglars can't operate when there is no light. Consider the fact that excessive, i.e. dazzling, light causes pitch black shadows and makes people avert their eyes – ideal conditions for burglary. For domestic security lighting, 150 watt lamps are more than adequate and they save energy and equipment costs compared with 300 and 500 watt units. Even the 150 watt lights need to be directed carefully so typical, spotlight-style, security lamps need to be pointed down at an angle of 70 degrees or more, so that they don't cast obtrusive light on adjacent properties. Suffice it say that these are generally badly designed, scatter light in all directions and dazzle visitors but trade outlets can supply properly designed units from Italian and German companies. The lighting scheme proposed is the minimum required to undertake the task. In the edge of town or village locations, or in rural areas, landscaping measures will be provided to screen the lighting installation from view from neighbouring countryside areas. There will be no dazzling or distraction of drivers using nearby highways." The Stratford upon Avon Astronomical Society welcomes views and ideas from organisations and people who wish to help bring about improving attitudes and approaches, particularly in Warwickshire and the surrounding counties, to reducing light pollution.